"My First Rock-Climbing Experience was Amazing!" Rock Climbing – Tom was my guide for this trip, he was not only patient as it was my first attempt and I am also very nervous of heights but he ensured that my safety was the top priority. At no time did I doubt his skill or his passion for his sport. It was an absolute pleasure to learn from him. My First Rock-Climbing Experience was Amazing! 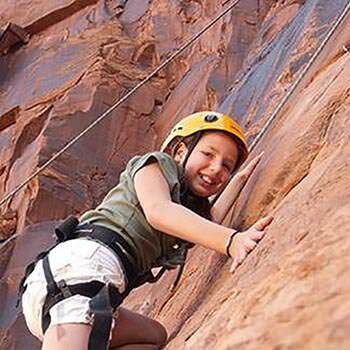 We booked through Moab Adventure Center this year after having excellent experiences in 2010 on three adventures (hummer tour, rappelling Ephedra Grotto, and river rafting), going for rock climbing this year. It was my first time and we had a blast. Garr made the adventure extra special with his knowledge, expertise, and positive/fun attitude. Thanks for a great time and wonderful memories!